Eleanor Schuker, M.D., is a Training and Supervising Analyst at the Columbia University Center for Psychoanalytic Training and Research, where she teaches a course for candidates on Gender and Sexuality and leads a seminar for graduate analysts on the Psychology of Women. She is an Associate Clinical Professor of Psychiatry at the Columbia University College of Physicians and Surgeons. Dr. Schuker founded the St. Luke's Hospital Intervention Program in 1977 and was the psychiatric consultant to the Women's Counseling Project at Columbia from 1974 to 1989. She has been a member of the American Psychoanalytic Association's Workshop on Issues for Women in Psychoanalytic Training since 1981. 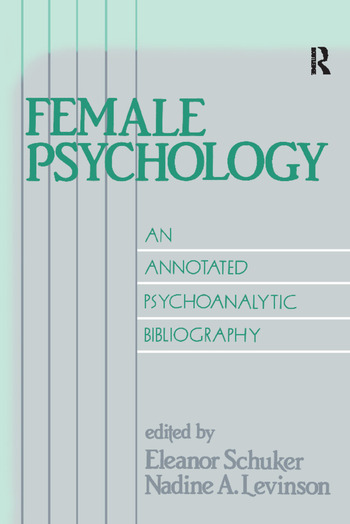 Dr. Schuker has written and lectured on gender-related issues and on female psychology. Nadine A. Levinson, D.D.S., F.A.C.D., is a member of the San Diego Psychoanalytic Society and Institute and Associate Clinical Professor of Psychiatry and Human Behavior, University of California, Irvine. Dr. Levinson combines the private practice of psychoanalysis and psychotherapy with consultative work as a liason to dentistry. She has lectured widely on the psychological manifestations of dental disorders, TMJ and facial pain, and cosmetic dentistry and has organized many dental and medical seminars addressing dual-career conflicts in female and male professions. A past member of the American Association of Women Dentists' Task Force on Women in Dentistry, she was the American Dental Association's National spokesperson in 1986. Dr. Levinson currently gives psychoanalytic workshops on various aspects of female development, including eating disorders, pregnancy, and gender issues in treatment. She has been a member of the American Psychoanalytic Association's Workshop on Issues for Women in Psychoanalytic Training since 1986.